NEW YORK (CNNMoney) -- The steady onslaught of winter storms has wiped out snow removal budgets in cities and states all along the East Coast. Governments are shelling out millions of dollars to clear the streets of snow and ice, spending more than expected on salt and labor. The storms are the last thing public officials need since many are already struggling to close major budget deficits. "It's been trying not only on our manpower and equipment, but also on our pocketbooks," said Sam Williams, director of the streets, roads and forestry division in the Lexington-Fayette Urban County Government in Kentucky. "And we've got another six weeks to go." Williams just asked the county council for another $200,000 since his division has blown through the $800,000 it had budgeted. His employees have had to clear about two feet of snow so far -- roughly eight inches more than the historical average. In some places, all it took was one storm to drain the budget. New York City, for instance, ran through its entire $38.8 million snow removal account just to handle the 20 inches of snow that fell in late December. And the costs are expected to soar since the Big Apple has had to contend with its snowiest January on record, with 36 inches falling in Central Park. That doesn't mean that the city, which was criticized for mishandling the December blizzard, will pull back on its response when the flakes start flying. 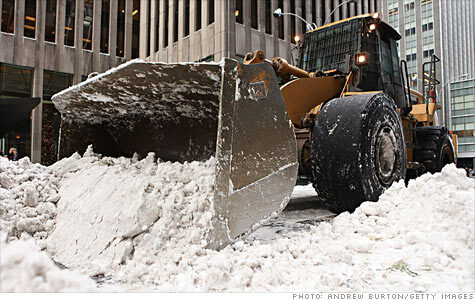 "We've never changed our snow-fighting plans due to budget concerns," said Jason Post, spokesman for Mayor Mike Bloomberg, who must close a $2 billion budget deficit before the next fiscal year starts in July. "We'll find the money elsewhere." It's not that unusual for cities and states to spend more than budgeted on snow removal. After all, it all depends on how much of the white stuff Mother Nature sends their way. New Jersey's Department of Transportation recently exceeded its $20 million snow removal budget, which will force it to ask the cash-strapped state legislature for more money at the end of the season. But it still has a ways to go to top the $41 million it spent last year to clear its nearly 13,000 miles of road or the $31 million expended the year before. "We have processes and mechanisms in place to transfer money to ensure we can keep fighting the snow through the winter," said Tim Greeley, a department spokesman. For some municipalities, plowing the snow isn't the only expense. It's getting rid of it after. Westport, Ct., has been hit with about 38 inches of snow this winter, too much to leave on the side of the road. So it now has to transport mounds of snow to parking lots by the beach and in town. This isn't cheap. It cost $60,000 to move the 20 inches of snow that fell on Westport schools in mid-January. That helped drain the town's $400,000 snow removal budget. Blowing the budget isn't the biggest concern for Steve Edwards, the town's public works director. It's the condition of his employees and equipment. His department has lost 20% of its workforce over the past three years due to budget cuts, leaving the remaining staff to shoulder the burden. "My men are tired," he said. "How many nights can they pull all-nighters?"